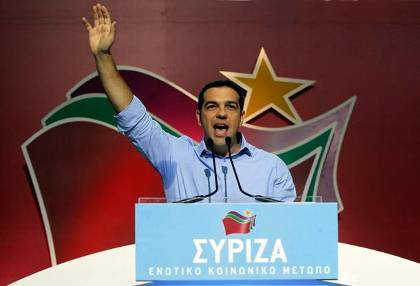 The Syriza swish-star logo makes a cool “mark of the beast”. But anyway, Tsipris met with the Pope. His supporters are called The Earthquake. He might bring down the Euro! Dogs and cats living together! The Signs! The Signs! Alexis Tsipris is like, what, the 20th possible antichrist? Whatever happened to Juan Carlos of Spain? What about Obama? HE came from nowhere and was backed by some mysterious, nebulous group to become leader of the most powerful empire on earth, right? And now he’s being upstaged by some dude in rinky-dink Greece? In all likelihood, Tsipris is NOT the antichrist (again), the End Times are NOT coming, the “signs” are a collection of unrelated events, and endtimers are going to die regular deaths like every other person on the planet. Christians wanting to go to heaven while seeking to avoid the prerequisite step are acting against the central doctrine of their faith. Even Jesus had to do the whole death and resurrection thing. The dispensationalists (dispensationalism is the heart and soul of USAmerican fundamentalist Christianity) want you to think they represent the true ancient Christian doctrine. No, this eccentric 19th-Century clergyman started it all. You’re damn right he’s not the Antichrist. The Devil is a cheap SOB. He wouldn’t spring for a decent health care plan. The Grays did, and they even agreed to leave out “The Probe”.